On 29 and 30 October, the Solar Academy of the IEA SHC Programme held a 1.5-day training course on solar district heating in Lianyungang, at Sunrain Solar Energy’s headquarters. 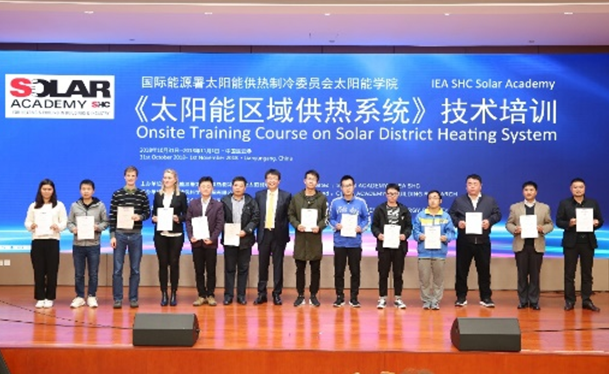 It provided around 150 researchers, engineers, planners, other technical staff and students from organisations with ties to the solar thermal industry with the opportunity to listen to presentations by four dedicated experts from Europe and China and obtain a course certificate thereafter (see photo). 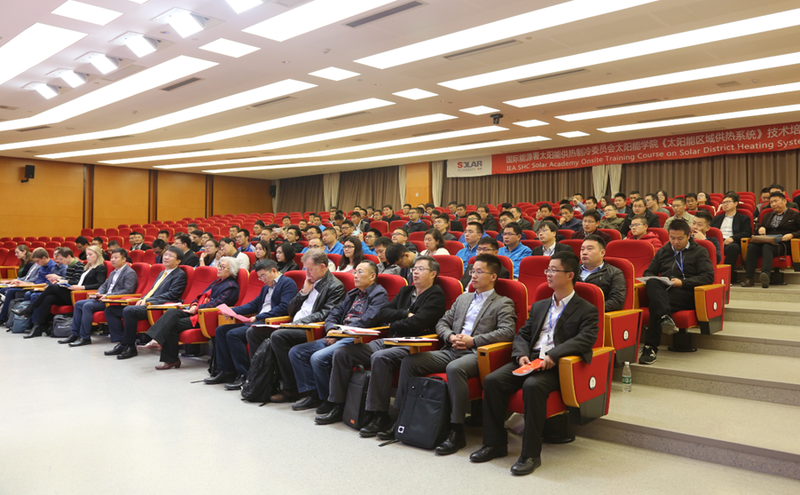 The event had been organised in cooperation with the China Academy of Building Research (CABR) and Sunrain Solar Energy, the world’s largest collector manufacturer. The course took place in the same week as the SHC Task 55 meeting. Since the autumn of 2016, SDH experts from around the world have met regularly to discuss market and technology development as well as research results regarding solar district heating. Thirty of these professionals, who come from 16 institutions and 7 countries, joined the Task 55 meeting in Lianyungang. Three task experts were selected to train attendees of the SDH course. Jan Erik Nielsen, head of Task 55, shared his knowledge about system design and performance guarantees. Jianhua Fan, who works at the Technical University of Denmark, introduced strategies for analysing systems and choosing key components. Christian Holter, Managing Director of S.O.L.I.D., an Austrian-based supplier of turnkey solar thermal systems, presented case studies on large solar heating and cooling installations. 1.5-day solar district heating course, hosted by Sunrain Solar Energy at its headquarters in Lianyungang. The group of experts who would conduct training was joined by Ruicheng Zheng, a professor at CABR and Chief Engineer at the National Centre for Quality Supervision and Testing of Solar Heating Systems. She spoke about how to calculate heat consumption and design HVAC systems which comply with Chinese standards. Each presentation was translated for the Chinese members of the audience. “The participants have all been satisfied with how the training went and asked the experts a lot of questions,” said He Tao, Professor at CABR and co-organiser of the training course. The IEA SHC Programme launched the Solar Academy to share work results with a wider audience in the academic and technical fields. It offers webinars, so-called national days and training workshops. You can find the programme and schedule on the Solar Academy’s website. The high point of the international SDH gathering was the tour of a solar district heating installation that had been planned by Chinese-Danish joint venture Arcon-Sunmark Large-Scale Solar Systems Integration. 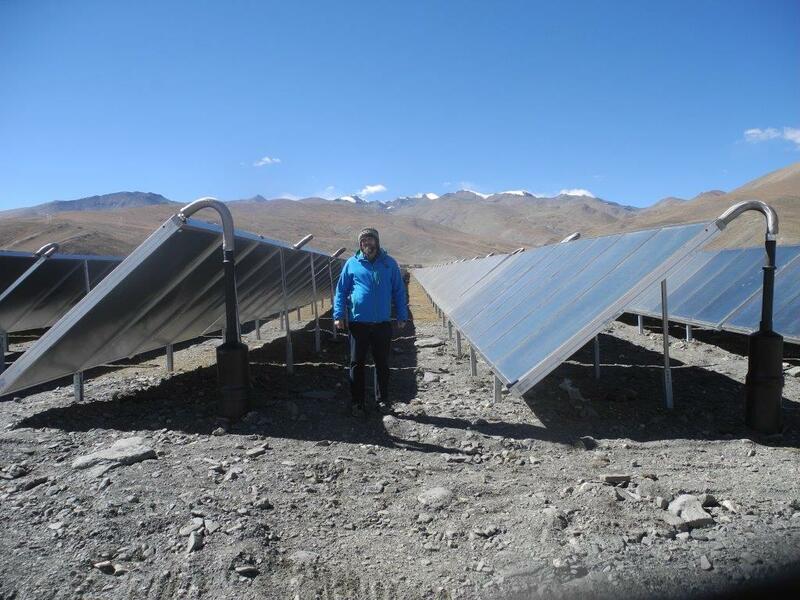 At Sunrain’s invitation, 18 task members flew to Tibet to take a look at the solar district heating plant in Langkazi, a town in the south of the region, where the venture has been installing 22,275 m2 of flat plate collectors and 15,000 m3 of pit storage. The entire system would be finished soon and be up and running before the end of the year, said Leo Holm, who works at Arcon-Sunmark and guided the Task 55 members around the site. It´s supposes to contribute 90 % of the heat to the new district heating network in Langkazi. Via a 65 °C supply line and a 35 °C return line, the grid reportedly supplies thermal energy for 100,000 m2 of residential floor space. The joint venture has manufactured and delivered the collectors and supervised the installation of the SDH plant. A 3 MW electric boiler guarantees backup energy in times of low irradiation. The facility is part of a larger endeavour to popularise renewable heating in Tibet. Feasibility studies have been conducted in over 20 of the region’s counties and cities, and Tibet’s local government has approved funding for five of them.